Judging by the November NPD break-down last weekend, the Grand Theft Auto franchise is more alive than ever. Grand Theft Auto V came only second to Call of Duty: Advanced Warfare, in overall software sales last month – even generating more buzz than Halo: The Master Chief Collection and Assassin’s Creed: Unity. The elephant in the room since its original September 2013 release, has been the whereabouts of the Online Heists. Rockstar Games had been quiet since the next-generation deploy of the open world title, until today. The first trailer for GTA Online Heists is seen above, showcasing some of the four-player co-op missions you and friends will soon be playing in the coming weeks. 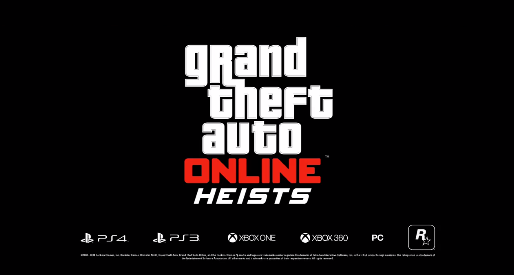 Although an official release date hasn’t been set, Rockstar Games did ensure the added DLC would be arriving early 2015. Get a taste of the crazy action to expect in your extended experience through Los Santos and Blaine County; including new vehicles, weapons, clothing and gameplay.